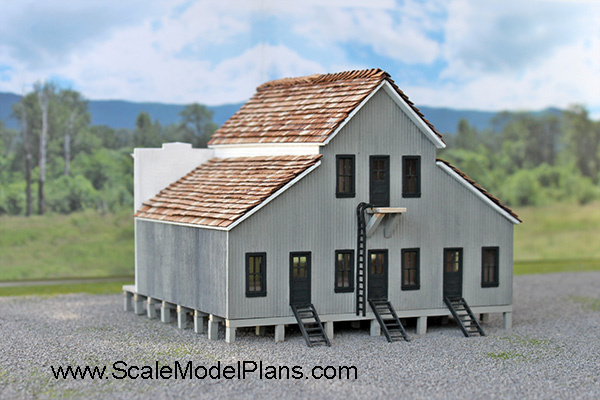 Model Railroad Building Plans for N, HO, OO, and O scale structures. 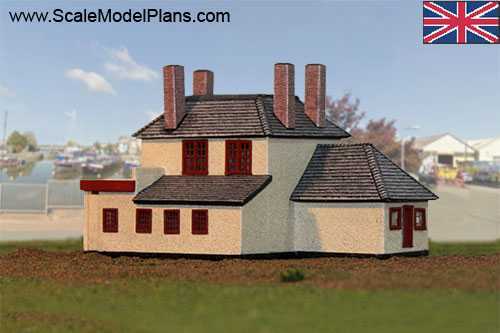 For Licensed users of the Evan Design Model Builder software program we have created importable template files allowing you to easily create your own customized cardstock version of our plans. Click here for more information. Instant download: Place your order, pay securely with PayPal - even if you don't have a PayPal account. Download your plans immediately to get started on your next project! Plans are NOT sent by mail! Instantly download your plans and you can start your project within minutes of placing order! For Copyright and Licensing, plans are automatically registered to your email address and the IP address of the computer used to download. Please contact us if you use a computer other than your own to download the plans. Click here to see how easy it is to get started! Saskatoon's Firehall No.3 was opened in 1912 during the era of horse drawn fire equipment. It has gone through various changes and renovations over the years, and was decommissioned in 1958. In 1991 it was designated as a heritage building and is currently operated as a restaurant. 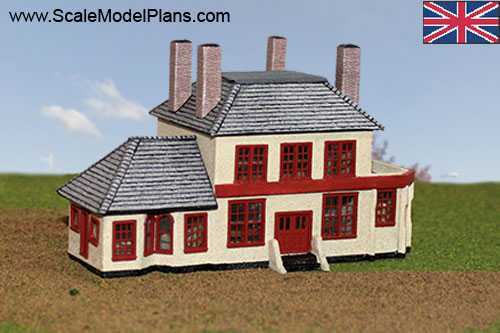 This HO scale version was constructed with 1/16" balsa, finished with brick paper from Micro Mark. Windows are from Northeastern Scale Lumber Co. and Tichy Train Group. 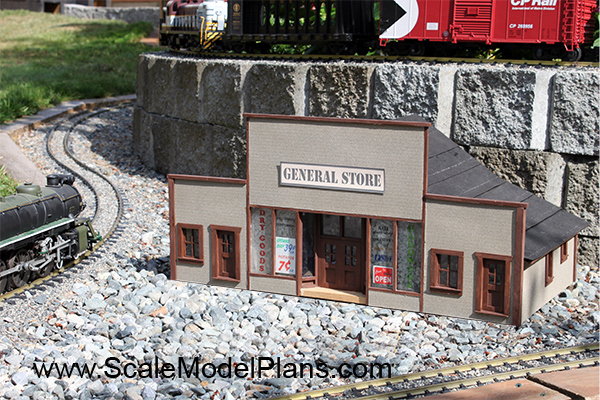 Scaleable to Z, TT, or S Scale - See tutorial on building to other scales. The Fernridge Garage was part of a lone commercial area a few miles south of Langley, British Columbia. The business started as a rural Post Office in the early 1920's and shortly after, added a small grocery store. 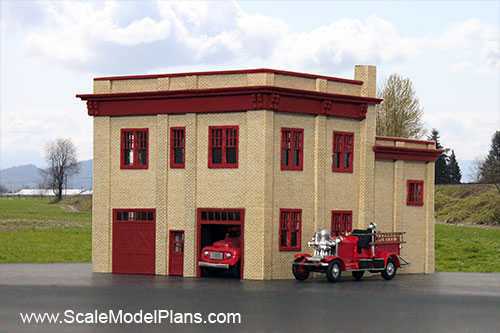 It is not clear when the garage was added, but at one time the tiny structure housed a tire store as well. Whether it was a sign of economic times, or development favoring another part of town, one by one, operations ceased. At the time of researching the project the structures were still standing, but in need of repair. Garden Scale 1:24 and RC Scale 1:10 are available at www.ScaleModelBuildings.com. 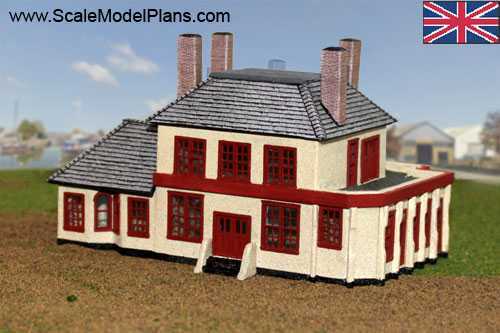 HO scale cardstock version shown uses gas pump from Micro Mark but all scales include plans for easy to make scratch built pump as shown in the Garden Scale example. Situated on the south bank of the Thames River, Gravesend in Northwest Kent in England was closely tied to maritime history. The town also hosted terminals for both the Gravesend & Rochester Railway London, and the Chatham and Dover Railway. On the corner of Russell and Canal Roads, a few blocks north of the London & South Eastern Railway tracks, sits the Canal Tavern. 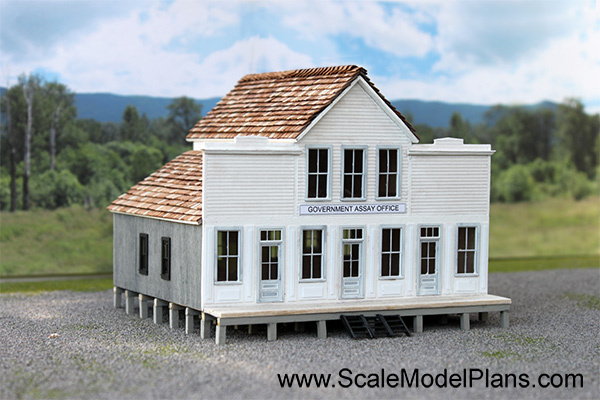 This N Scale model was constructed with balsa wood and sprayed with RUST-OLEUM ® texture paint. 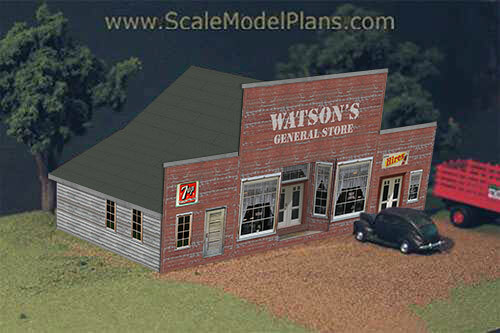 This is an HO Scale cardstock version of Watson's Store in Spalding, Idaho, but it could be any one of hundreds of typical country stores across the country from the mid 1800's to present day. Watson's store operated from 1911 to 1964. The store contained living accommodations, and ultimately included a Post Office. 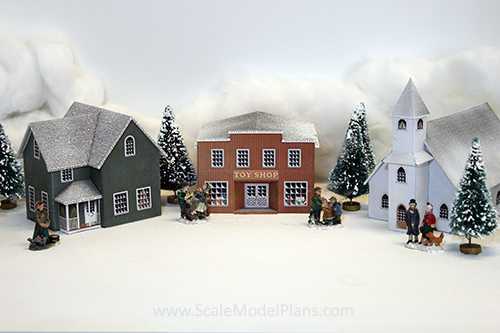 Model Railroading may be our forté, but Christmas Spirit is right up there too! This is a Christmas craft designed more for a fireplace mantel than a railroad layout. Make this a family project for Christmas. Create a Christmas decoration while introducing the family to cardstock model making. 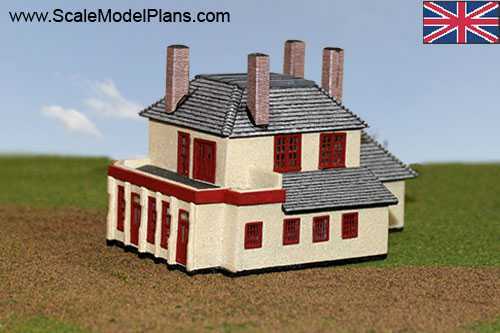 * Please note: This is a cardstock-only package and does not include scaled plans or templates. In the mid 1800’s, several government assay offices were established throughout the Colony of British Columbia in strategic gold mining towns such as Atlin, Barkerville, New Westminster and Victoria. In the assay offices, miners would have their gold dust and nuggets weighed and receive the equivalent value in coins or treasury notes. This is the Government Assay Office in Barkerville, British Columbia. 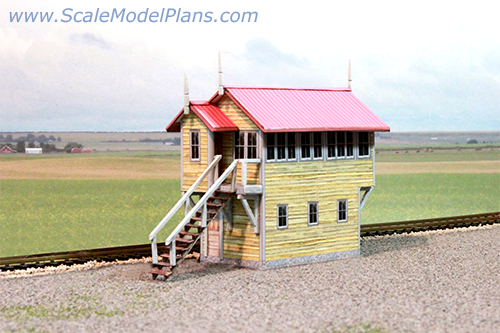 This model uses clapboard and Board & Batten siding from Northeastern Scale Lumber Co.